Empowering & motivating leader; software development background; inspires & enables teams to exceed expectations; believes people are key to successful ventures. Please note that all opinions are personal and may not represent the views of organisations that I am connected with. 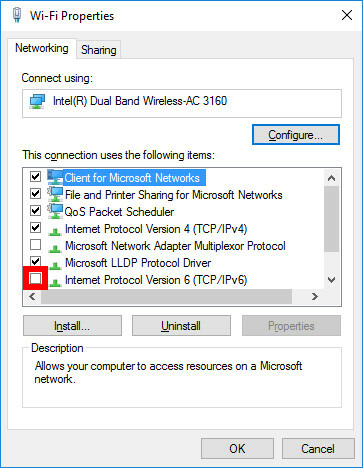 I’ve been struggling with my WiFi connection on Windows 10 for a while. It would connect but not get access to the internet, or perhaps connect and work perfectly for a while – anything from a few minutes to a day or so – and then lose connection to the internet even though it was still connected to the WiFi point. Restarting my laptop didn’t usually fix it, but restarting the access point usually did, so I assumed the issue was with the WiFi point. However, I recently upgraded our WiFi point and the issues still occurred. Searching on the web produced plenty of ideas to try, but none of them worked. My laptop came with Windows 10 pre-installed and most of the advice related to machines that had been upgraded to Windows 10. I eventually found an anonymous comment on a post on microsoft.com relating to Windows Vista which suggested turning off IPv6 which indicated “I fix many computers each day, it’s my job… so If this doesn’t fix your prob then I’d really like to know cos it hasn’t failed me yet “. I gave it a go, and my internet connection was restored. A week later, I still haven’t seen any recurrence of the problem, so I am confident that the problem is fixed. Clearly, this fix won’t work if you need IPv6, but I’m still using IPv4, as are the majority of users, especially in home networks. Hopefully this will help someone else! I love Google’s Picasa application for managing photos, but I have been putting off migrating from Windows XP to Windows 7 for some time. Blogs and forums show that this is a troublesome task that often results in people losing their face recognitions, etc. It seems that Google have not provided a mechanism for restoring a Picasa backup onto a new machine with a different directory structure. Instead of a Picasa backup, I used a backup of my photo directories and a backup of my Picasa database, but you could modify my procedure to get this to work with a Picasa backup. So, for my own future reference, and hopefully to help others, here are the simple, though time consuming, steps. Restore the photos to the correct locations. This is essential. The Picasa database refers to photos in specific locations, so if these are wrong, you will lose things such as your face recognitions. I had to create a Documents and Settings directory on Windows 7 and put my photos in the correct place under there, matching the exact orignal paths. I also had to use an external drive for the photos that had been on a separate E: partition on my old PC. If you are unsure what the original paths were, you can find these in the watchedfolders.txt file in the Picasa2Albums application data directory (see step 2 if you are not sure where to find this). Copy the 2 picasa directories from settings/Google. Both of the Picasa directories are needed: Picasa2 and Picasa2Albums. Make sure you put them in the correct location on the new machine. The precise location of the application data directory will vary, but on XP is likely to be under the user’s Local Settings / Application Data / Google and on W7 to be under the user’s AppData / Local / Google. There are two Picasa directories, one called Picasa2 and the other called Picasa2Albums. Install the latest version of Picasa. Run Picasa. If you sign on with your Google account, you will need to use the same account as previously so that the contact information matches. I don’t sign on and Picasa just uses a local contacts file which it keeps in its settings directory. At this stage, you will be able to tell if everything has worked. Use Picasa to move photos to the correct location. It is important that photos are moved using Picasa if you want it to keep track of them and associated data, such as face recognitions. Set Picasa to watch the new directories before you move, use the tree view in Picasa and move directories to their new location. In my case, I wanted the photos moved from C:\Documents and Settings to C:\users and from E:\ to C:\users. Tidy up the temporary photo locations. In my case, I had to delete the temporary directories from E:\ and the temporary Documents and Settings directory. Enjoy Picasa on your new machine! LinkedIn allows you to display a set of skills in your profile. Your first degree connections can endorse your skills, but they can also endorse you for skills that you haven’t specified and after a while you will probably find yourself being endorsed for skills that you don’t actually have. While skill endorsements are less important that recommendations, they still carry some weight. Endorsements for random and inappropriate skills do not look professional though, so you should either turn off endorsements on your profile, or spend a little time once in a while to manage them. Start by identifying the set of key skills that you have. These will be used by LinkedIn as a starting point to prompt your connections to endorse you, and will therefore encourage more relevant endorsements. You should also order these so that the skills you want to be highlighted most are at the top. Your top 10 will be listed as your Top Skills and the remaining ones will be listed under also knows about. Make sure that your top 10 are the ones that you most want to be recognised for; if you have too few, consider splitting a skill into multiple specialist skills; if you have too many, consider combining two or more into a single more generic skill. When others endorse you, LinkedIn will prompt you to add the endorsements to your profile. Remove any unwanted ones from the list by clicking the X and then click Add to Profile. You can hide endorsements later when editing your profile, but if you do not add them to you profile, they will not be there later for un-hiding. Either way, it is worth taking the time to hide irrelevant ones so as to keep your profile focussed and more professional looking . And last but not least, take the time to endorse your connections for their skills. The quickest way to do this is to respond to the LinkedIn prompts. If you want to endorse a specific individual, then visit their profile where you will usually be prompted to do so; this prompt box also includes space at the end of the suggested list to type in other areas of expertise. If you scroll down their profile to the Skills & Endorsements section, then you can endorse any specific skill in their list. To suggest a new skill for someone when the suggested endorsement box does not automatically display, click on Send a Message and then Endorse; this will bring up the box. Your photo is probably the single most important thing on your LinkedIn page. For most people looking at your details, the photo is the thing that they will look at first and remember last. Their overall impression of you will be determined more by this picture than by anything else on your page. If the picture is too casual, you may not be taken seriously as a professional. If you look too stern, you may come across as unapproachable and hard to work with. Ask the question, does this picture portray the image that I want to project to colleagues and acquaintances? If the picture is of poor quality, what does this convey about your attention to detail or about the sort of person that you are? LinkedIn photos are displayed in a square format. If you upload a rectangular picture, it will be stretched to fit the square and this usually looks awful. It used to be that the correct photo size was 80×80, but this has been increased to 200×200. Right now, as I write this, I still have an 80×80 photo, but LinkedIn has stretched it to 200×200. It looks fine, but if you still have an old 80×80 photo, you should check how it looks and probably plan to upgrade it sooner rather than later. The minimum size should now be 200×200, but you are allowed to upload a photo as large as 500×500, provided the file size is less than 4MB. Acceptable file formats are JPG, GIF and PNG. You will almost certainly need to crop your photo to the correct size. There are many tools available to do this including some very good free ones. However, the simplest way is to use the editing tool on the LinkedIn web site after you have uploaded your photo. You should aim to include your head, the top of your shoulders and not much more. Don’t upload a cartoon rather than a photo; this is no longer against the terms of LinkedIn but it doesn’t look professional. Having a good photo on your profile makes it easier to relate to you as a person. It makes it easier for someone who has only met you once to remember who you are, and it makes it easier for someone to spot you at an event if they are keen to make contact with you. You can choose whether your photo is only available to your immediate connections or to your network (connections to the third degree) or public (ie anyone and everyone). If you want people who already know you to make contact, I would recommend making your photo public. One of the most frequent reasons for me not inviting someone to be a connection is my not being sure that I have found the correct person, whereas if they had displayed a photo, I could have been sure. Once you have set up your LinkedIn account (which is free), your first task is to create your LinkedIn profile. This is your online CV and is your chance to impress those who want to know more about you. Get this right before you start to create your network, as you may only have one chance to make a good impression on someone who can make a difference to you. Just put your name in the name field. That’s what the field was designed for and it looks more professional if you stick to the convention. Adding an email address or a job title might make it easier for people to find and contact you, but it clutters names in listings of contacts and it will annoy people. It also breaks LinkedIn’s rules and is likely to get your account shut down. Further, publishing an email address in this way is likely to ensure that you start to receive a lot of spam. List every job you have had and provide a short description of what the company did, what you did, and most important, what you achieved in that job. This will give people an idea of who you are and what you are capable of. It will also make it much easier for former colleagues to find you. Ensure that you make use of relevant keywords within your description (especially things that you might want someone to find you for). Spend time getting your summary right – this is your “elevator pitch” which will either get someone’s interest quickly, or let them know that you are not the person they need. Make sure that you use the additional information section to add any other important details about you that have not already been included elsewhere, eg, professional qualifications and memberships. Add a photo to your profile – this makes it easier to relate to you as a person, it makes it easier for someone who has only met you once to remember who you are, and it makes it easier for someone to spot you at an event if they are keen to make contact with you. You can choose whether your photo is only available to your immediate connections or to your network (connections to the third degree) or public. I’m updating the posts about LinkedIn that I made on my website a few years ago and will be publishing them over the next few months. This is the first installment. LinkedIn differs from most other networking sites in that it is focused on business and professional connections rather than social ones. If used properly, it can be a very effective business tool. LinkedIn continues to grow and now has over 275 million members. LinkedIn is a great way of keeping in touch with business contacts. but getting started can be a little scary. You don’t want to get it wrong and end up with your account blocked, or annoy your existing (real world) network so that your best contacts refuse to connect with you. Nor do you want to end up entered into a commitment where you spend hours of your precious time fixing things that you did wrong before you knew what you were really doing. I have written this guide based on my research and my own personal experience of how to get the best out of LinkedIn. You shouldn’t follow my advice prescriptively as you might find that doing some things differently works better for you, but you should find this a good place to start. In order to free up some disk space, I tried compacting my Outlook 2007 .ost file earlier this week. This should happen automatically in the background when my PC is idle, and it probably has been, but my file was large and manually executing the compacting function saved me around 20% of the file size. However, today, and quite by accident, I discovered a much better way of reducing the size of the .ost file and got it down by another 50%, or, in other words, reducing it to 40% of the original size. Important: this method does not work with .pst files. Only use it on .ost files which are a copy of data held on your exchange server. If you are not sure what that means, do ask someone who does know before you try this. My laptop failed to wake up from hibernation and I had to do a full reboot, and when I tried to launch Outlook I discovered that my .ost file was corrupt. There is a tool called scanpst which will attempt to repair .ost and .pst files, but then I wondered what would happen if I just deleted the corrupt file; all the data in the file is also on the Exchange server, so presumably Outlook could re-create the .ost file. A quick search on google confirmed that this would work, so after renaming my .ost file (just in case it didn’t work), I restarted Outlook. Outlook started with an empty calendar, empty mailbox, and empty contacts, but as soon as I tried to open one of the relevant folders, it started to download the contents of that folder from the server. I picked the folders I needed most immediately (such as my inbox) so that it would do them first, and then tried opening each of the other folders in turn to ensure that they were downloaded. Outlook downloaded more than one folder at a time. The biggest folder was my inbox and that took a couple of hours to complete, but the big surprise, when it had all finished, was that the .ost file was only half the size of the old one, even when that old one had been compacted. Further, the time taken to create the new one was a lot less than the time taken to compress the old one, and I was able to use Outlook while the download took place. When compressing a .ost file, it is not possible to do anything else with Outlook, and due to the significant disk activity, other things on the PC run slowly. Next time I need to compress my .ost file, I will simply be creating a new one. For some time I’ve been thinking that I must make better use of styles when creating documents in Microsoft Word. They are there to help provide consistent formatting in the document you are working on, and if you get them right it is then easy to apply consistent formatting across all the documents that you create. However, I’ve always found them a bit difficult to understand, and have therefore never really got the correct styles set up to allow me to gain the benefit of them. Recently, I have been working on a document which consists mainly of multilevel numbered lists. The effort of trying to get them right without styles was proving too much. I concluded that the effort to work out the styles and how to apply them correctly was going to be quicker than persevering the old way. Multilevel numbered lists are even harder to work out than regular styles. It wasn’t that I didn’t know what I wanted, it was working out where to find the correct option to set the value that was needed. This involved many searches on Google, where I found most of what I needed, but the biggest problem was working out how to fix the indentation. In trying to solve this one, I found a great page on multilevel numbered lists that not only explained how to fix my indents, but also explained a few others things that I had either done badly or where I had not yet needed to know the answer. So, if you are trying to solve style problems with multilevel numbered lists, take a look at Word 2007: Taming multilevel list numbering. If you want to learn about styles in general though, this would also be a good place to start. If you can master styles in multilevel numbered lists, you can probably cope with any style related issue in Microsoft Word. Having got to the point that I now understand styles and how they work, I will be making much greater use of them. It was worth the effort to do so. I’ve now moved my WordPress site to the root of my web site, and I’m pleased to say that the task was much simpler than I expected. The WordPress installation remains in the same place. All I had to do was log in to WordPress, change the URL for the site address, and then copy and amend a couple of files on my web server. I didn’t need to update my permalinks structure, even though the instructions at codex.wordpress.org suggested that I would need to. I did do one extra thing though, as I don’t want to confuse Google into thinking that I am trying to confuse it’s search ranking algorithms. The old blog links still work and so I therefore appear to have two identical WordPress sites. Google can penalise you for this in their search rankings. I removed the old blog subdomain name using my web hosting account. Postscript: removing the subdomain name did cause a rather nasty complication. Once the DNS entries propogated, WordPress stopped working. I had used the subdomain in the WordPress URL and the solution was to update the WordPress URL to use a subdirectory of the main site.